본고는 인도네시아 신질서(Orde Baru; 1966-1998) 체제하에서 진행된 여성다움의 제도화된 이미지를 고찰해보고, 다르마 와니따(Dharma Wanita), 뻬까까(PKK), 교과서 및 인도네시아 국영방송에 표상화되어 있는 제도화된 여성다움을 검토한다. 본고는 인도네시아 신질서 기간 동안, 여성다움을 가내적 공간에 국한시키는 국가 이데올로기인 `이부이즘(ibuism)`의 테두리 안에서 특정한 여성다움의 이미지가 제도화되었음을 밝히고, 이 제도화된 여성다움이 다르마 와니따(Dharma Wanita), 뻬까까(PKK), 교과서 및 인도네시아 국영방송 등을 통해서 전파되었음을 피력한다. 결론을 맺으며 본고는 또한 특히 1990년대 중반이후, 여성다움의 불특정하고 다각적인 현대적 이미지가 대중매체를 매개로 전파되어왔고, 이러한 현대적 현상으로 인해 신질서체제 이후인 2000년경 인도네시아 여성다움의 이미지는 다소 경합적이었음을 지적한다. 본고는 기존의 연구물들이 심도있게 다루지 않은 여성다움에 대한 국가 이데올로기의 `수단`과 `내용`에 대한 상세한 논의를 진행하며, 이를 통해서 인도네시아 신질서 체제하에서 진행된 여성다움의 제도화된 이미지를 이해하는데 소중한 자료가 되어줄 것으로 기대된다. 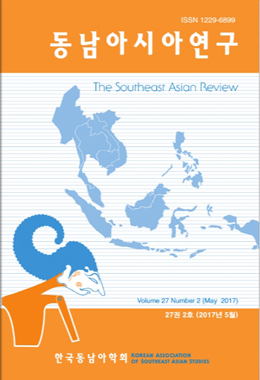 This paper examines the institutionalized images of Indonesian womanhood during the Orde Baru (New Order; 1966-1998). In doing so, it discusses these images as manifested in the Indonesian constitution, governmental organizations such as such as `Dharma Wanita` and `Pembinaan Kesejahteraan Keluarga` (PKK), school textbooks and `Televisi Republik Indonesia` (TVRI) dramas. Under the post-1966 Orde Baru, certain images of womanhood were institutionalized under the influence of the state ideology of womanhood (`ibuism`) which emphasizes women`s roles in the domestic domain. These institutionalized images were propagated largely by governmental organizations such as `Dharma Wanita` and `PKK`, and even transmitted through educational text-books and mess media such as TVRI. In conclusion, it also points out that since the mid-1990s, other `discursive` and `multi-faceted` contemporary images of womanhood have emerged through the mass media in Indonesian society. Consequently, images of Indonesian womanhood were somehow contested by 2000 and beyond. This paper is expected to develop a detailed discussion on the `means` and `contents` of the state ideology of womanhood. Therefore, this paper is expected to add a significant contribution to comprehending the institutionalized images of Indonesian womanhood during the Orde Baru regime.